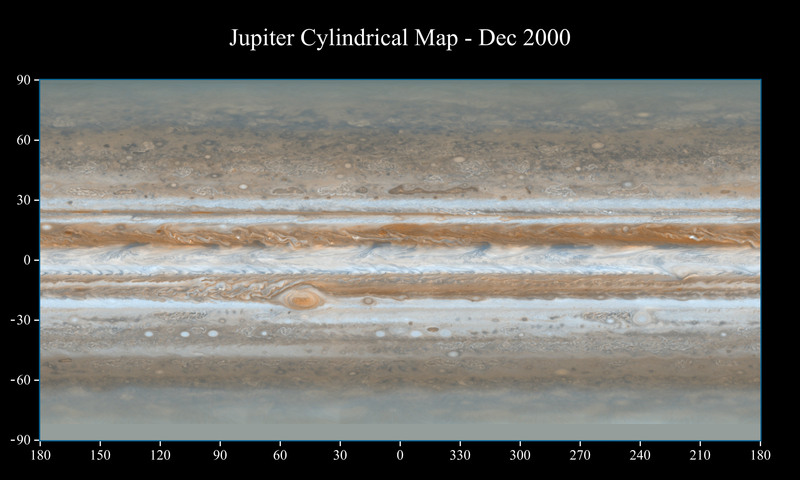 This map is part of a group release of cylindrical and polar stereographic projections of Jupiter. 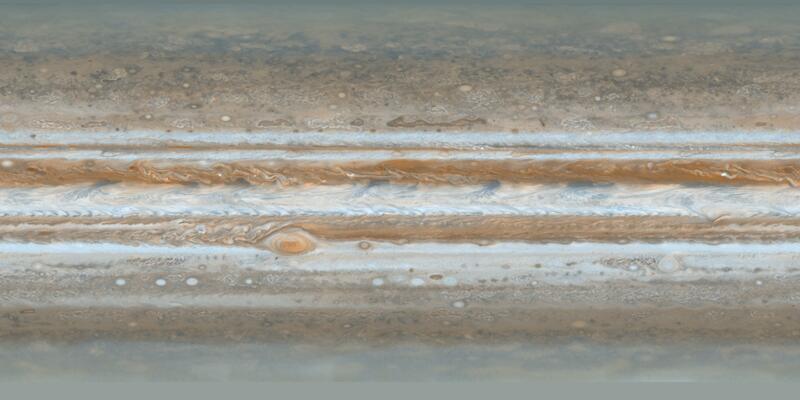 For the other maps see PIA07783 and PIA07784. 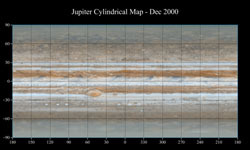 These color maps of Jupiter were constructed from images taken by the narrow-angle camera onboard NASA's Cassini spacecraft on Dec. 11 and 12, 2000, as the spacecraft neared Jupiter during its flyby of the giant planet. Cassini was on its way to Saturn. 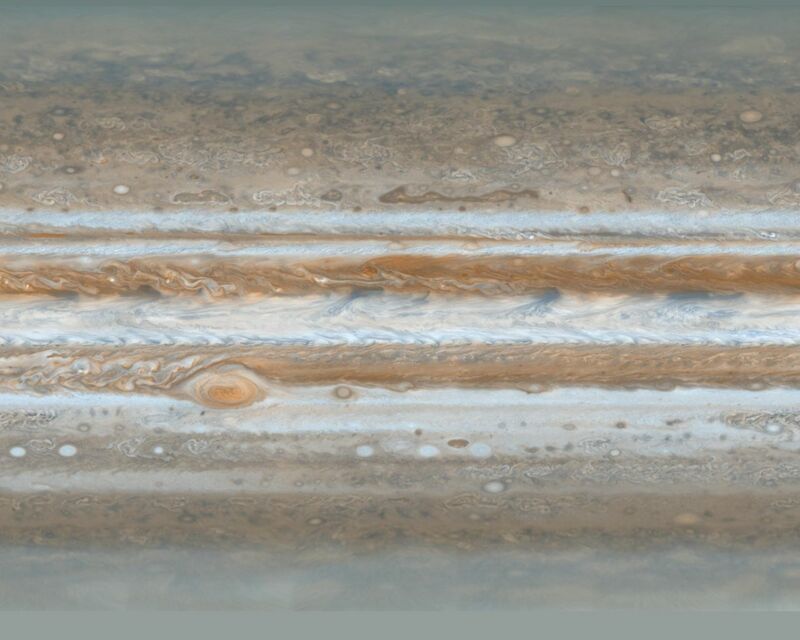 They are the most detailed global color maps of Jupiter ever produced. 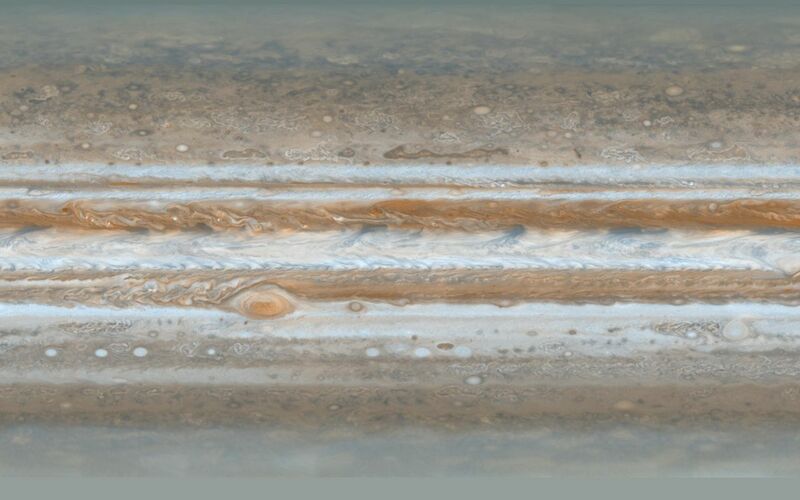 The smallest visible features are about 120 kilometers (75 miles) across. The maps are composed of 36 images: a pair of images covering Jupiter's northern and southern hemispheres was acquired in two colors every hour for nine hours as Jupiter rotated beneath the spacecraft. Although the raw images are in just two colors, 750 nanometers (near-infrared) and 451 nanometers (blue), the map's colors are close to those the human eye would see when gazing at Jupiter. 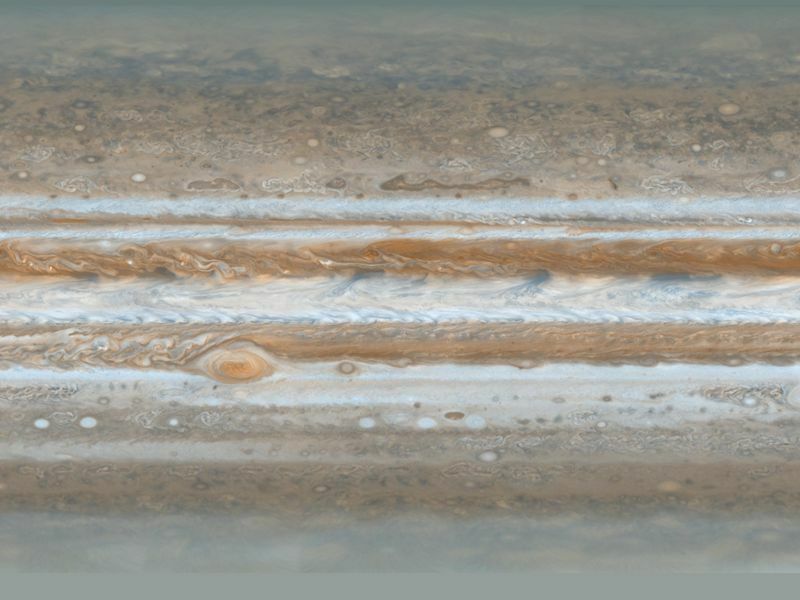 The maps show a variety of colorful cloud features, including parallel reddish-brown and white bands, the Great Red Spot, multi-lobed chaotic regions, white ovals and many small vortices. Many clouds appear in streaks and waves due to continual stretching and folding by Jupiter's winds and turbulence. The bluish-gray features along the north edge of the central bright band are equatorial "hot spots," meteorological systems such as the one entered by NASA's Galileo probe. Small bright spots within the orange band north of the equator are lightning-bearing thunderstorms. The polar regions are less clearly visible because Cassini viewed them at an angle and through thicker atmospheric haze (such as the whitish material in the south polar map -- see PIA07784. Pixels in the rectangular map cover equal increments of planetocentric latitude (which is measured relative to the center of the planet) and longitude, and extend to 180 degrees of latitude and 360 degrees of longitude.